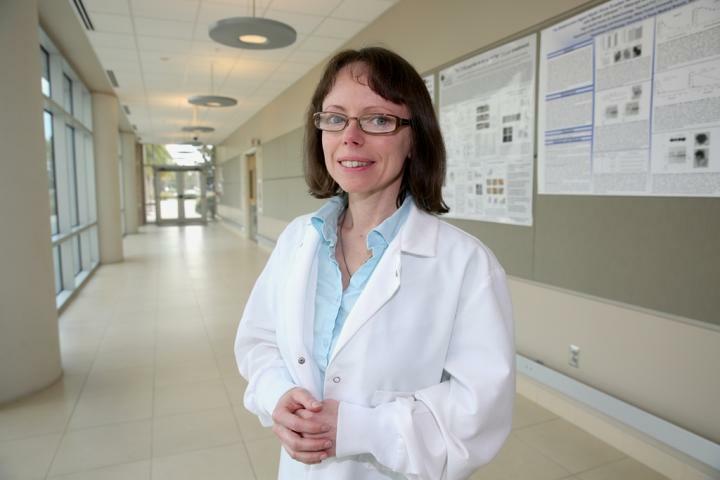 UCF College of Medicine cancer researcher Dr. Alicja Copik has just discovered a way to make that therapy viable to thousands by using the body's own natural killer (NK) cells in a new way. Her findings were recently published in OncoImmunology. NK cells are part of the body's defense system and act as an army to protect us from invaders like viruses and infections. Copik has discovered a way to make NK cells even more powerful – by stimulating them with nanoparticles that multiply them and heighten their killing ability. Her technology has been licensed and is now progressing to clinical trials as a therapy for leukemia and later for other cancers. In her latest study, Copik discovered that her energized NK cells do even more. They change the cellular makeup of tumors – especially the molecular defenses cancers use to protect themselves from the body's immune system. "Cancer is a very smart enemy," Copik explained. "That's why we have to use so many tools to fight it." For a malignant tumor to survive, cancers can place a protein molecule called PDL1 on their cells. The molecule tells the body's immune system, "I'm one of your own cells, so don't eat me" Copik said humorously. For patients with PDL1 on their cancers, new immunotherapy drugs use an antibody that blocks the PDL1 protection, allowing the body's immune system to kill the cancer. These drugs have been very successful – even in stopping Stage 4, metastatic cancer and leading to long-lasting remissions- but only for patients whose tumors test positive for PDL1. Only 15 to 30 percent of patients — depending on the cancer — have PDL1 on their cancer cells. Copik's goal was to make PDL1 therapies effective for more patients. In the lab, she discovered that NK cells, stimulated with the nanoparticles developed in her lab, attack the tumor and induce it to present PDL1 – which the new drugs then can target. In her study, combining NK cells with the new immunotherapy drug lead to improved survival rates in mice with cancer. Recent work from other scientists has shown that once inside the tumor, NK cells go a step further – they recruit other immune cells to prime the immune system to attack cancer. "So these activated NK cells will work synergistically with these immunotherapies," she said. Activated NK cells have advantages over other cancer therapies. First, they seldom cause side effects like chemotherapy and radiation. And the NK cells don't attack healthy cells. So cancer patients could safely receive additional NK cells from people who are not a 100 percent match. Because blood banks remove and discard NK cells when they collect blood platelets and plasma for donation, Copik said there is a potential for scientists to develop ways to save such NK cells for cancer therapies. Copik envisions her new discovery can be joined with planned NK cell clinical trials. And she said UCF's new comprehensive cancer treatment and research center – to be housed in the former Sanford Burnham Prebys research institute – will allow College of Medicine researchers even more opportunities to find a cure for cancer. The center will include basic scientists, like Copik, clinical researchers, cancer physicians and patients in the same facility. And the UCF researcher said such partnership will provide new opportunities for discovery – and inspiration. "As a scientist, it's important to know from physicians and patients, 'Where are the gaps in treatment? Where are the challenges?' You see where we should be directing our efforts," she said. "And when you're in the lab late at night you think about these patients. They are your motivation and your inspiration. You know we must do this work now because patients are waiting." Founded in 1963 with a commitment to expanding opportunity and demanding excellence, the University of Central Florida develops the talent needed to advance the prosperity and welfare of our society.